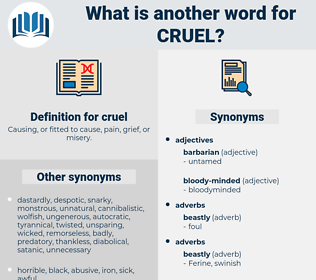 What is another word for cruel? Causing, or fitted to cause, pain, grief, or misery. wicked, horrific, terrible, barbarous, ferocious, dreadful, horrendous, grim, fierce, bitter, appalling, unkind, draconian, painful, murderous, relentless, stark, rude, difficult, bloodthirsty, nasty, crippling, oppressive, abominable, unmerciful, dire, torture, extreme, miserable. 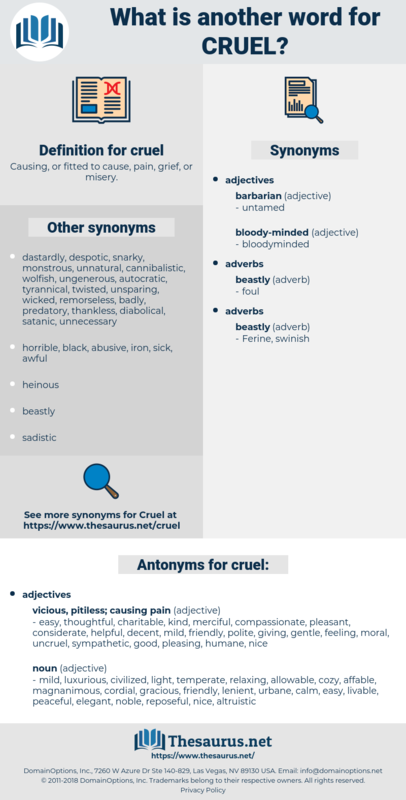 merciless, heartless, atrocious, inhumane, savage, vicious, severe, gruesome, cold-blooded, callous, horrible, quarrelsome, heinous, outrageous, violent, bloody, brute, monstrous, awful, horrifying, heavy-handed, tyrannical. decent, compassionate, giving, pleasing, gentle, kind, feeling, sympathetic, humane, thoughtful, helpful, considerate, pleasant, uncruel, moral. mild, luxurious, civilized, light, temperate, relaxing, allowable, cozy, affable, magnanimous, cordial, gracious, friendly, lenient, urbane, calm, easy, livable, peaceful, elegant, noble, reposeful, nice, altruistic, restful, philanthropic, soft, survivable, merciful, cultured, snug, graceful, moderate, affectionate, reasonable, peaceable, good, painless, polite, humanitarian, acceptable, pitying, pacific, gratifying, courtly, balmy, refined, clement, high-minded, warm, comfortable, benign, genial, unmalicious, amorous, delicate, charitable, hospitable. Me still the cruel Boy does spare; And I a double Task must bear, First to wooe him, and then a Mistress too.
" And it is cruel in you to bring me back to it. carroll, caesural, carol, cog railway, cyrilla, choral, ceryle, carlyle, cockerel, curlew, crawl, cure-all, cigarillo, kreul, cereal, carrell, Crewel, cowgirl, cascarilla, curl, chorale, coral, car wheel, creel, churl, crural, check girl, curly, creole, corolla, casserole, corelli, cheerily, carrel, criollo, carryall, corral.